¡Amigos, no puedo decir mucho, esto es más de lo que hubiera soñado nunca! Gracias a los que valoran mi trabajo de esta forma, lo disfrutan y me devuelven tanto cariño! Querría dedicar este premio a mis queridos padres Gloria y Eduardo, inspiradores y alentadores de tanto juego entre lápices, cuentos y canciones: ¡gracias, los quiero!!!!! Friends, I cannot say much, this is more than I could ever have dreamed of. Thank you to all those who value my work in this way, who enjoy it and give me so much warmth. I would like to dedicate this award to my parents Gloria and Eduardo who inspired me and encouraged so many games of pencils, stories and songs. Thank you, I love you!!!! Illustrator’s café at 12:50 on March 26. Very tense expections among the audience just minutes before the announcement. Kerstin Brunnberg, Chairperson of the Swedish Arts Council, opens the announcement by streamed link from Vimmerby, Sweden. 2012 ALMA recipient Guus Kuijer were sitting in the audience. Lennart Eng announces Isol from Argentina as the 2013 ALMA recipient! Here she is on the big screen! Isol herself was not present at the fair. 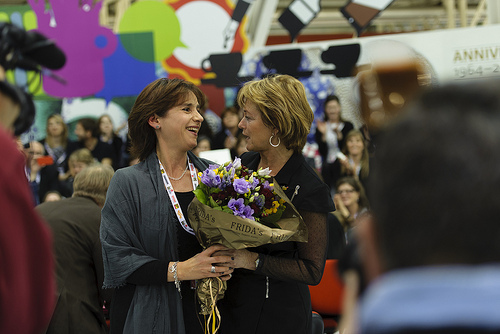 Veronica Mendoza from the Guadalajara Book Fair in Mexico (where Isol’s publishing house is situated) received flowers from the Swedish Minister for Culture, Lena Adelsohn Liljeroth. First phone call to Isol! 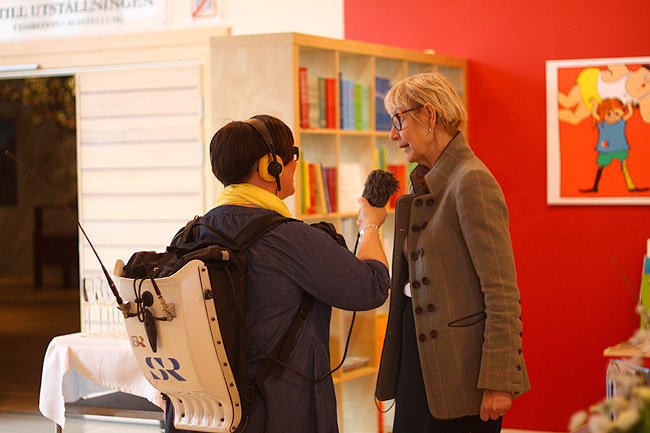 Listen to the phone call where Jury Chairman Larry Lempert, minutes before the announcement, informs Isol that she is the recipient of the 2013 Astrid Lindgren Memorial Award. Isol creates picturebooks from the eye level of the child. Her pictures vibrate with energy and explosive emotions. With a restrained palette and ever-innovative pictorial solutions, she shifts ingrained perspectives and pushes the boundaries of the picturebook medium. Taking children’s clear view of the world as her starting point, she addresses their questions with forceful artistic expression and offers open answers. With liberating humour and levity, she also deals with the darker aspects of existence. 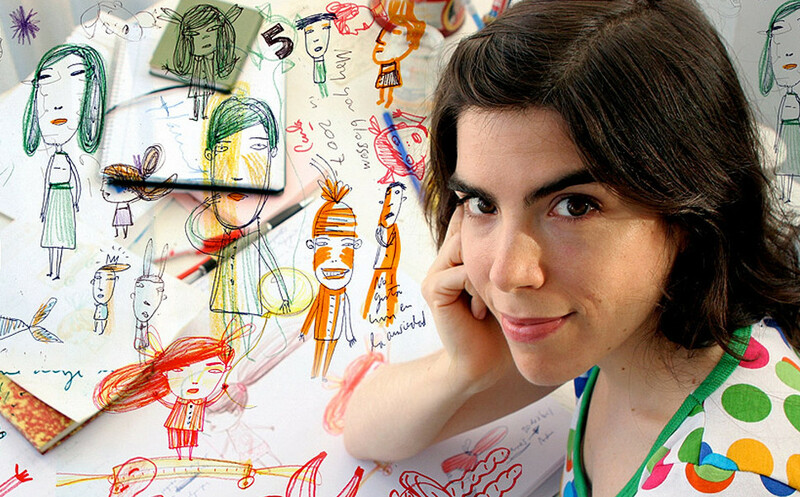 Isol is an illustrator, cartoonist, graphic artist, writer, singer and composer. She was born in 1972 and lives and works in Argentina. Isol was born Marisol Misenta in Buenos Aires in 1972. She began her artistic education at the Escuela Nacional de Belles Artes, “Rogelio Yrurtia”, studying to be an art teacher, followed by a couple of years at the Academy of Fine Arts in Buenos Aires. Isol is the writer and illustrator of about 10 published titles and has illustrated a similar number of published works by other authors. She made her debut in 1997 with Vida de perros, the story of a little boy who sees clear similarities between himself and his dog. Some of the characteristic features of Isol’s art were already present in this work: an expressive, sometimes explosive style with a muted colour palette, double outlines and deliberate misregistration in the colour printing of the motifs, where the lines and colours are not completely aligned. The stories are humorous with surprising twists, occasionally philosophical and always subtle. Isol is on the children’s side, seeing the world through their eyes and exposing the absurdities of the adult world. El Globo (2002) describes an angry, loud-mouthed mother who is transformed into a balloon. In Petit, el monstruo (2007), a child tries to figure out why his behaviour is considered praiseworthy on one occasion but cause for scolding on another. Isol is constantly exploring new formats and forms for the books themselves. Tener un patito es útil (2007) can be read from two directions with two different results: one story about what a boy can use a duck for, and another story showing what a duck can use a boy for. Nocturno (2011) is a beautiful introduction to the night’s dreams, printed in fluorescent colours that are best enjoyed in the dark. Isol’s great talent as a picturebook author is apparent in the overall experience created by the dramatic composition, the choice of colours and the intensity of the drawn line. The cultural centre Astrid Lindgren’s Näs. Vimmerby, Sweden 08:30 am. -10 degrees Celsius outdoors, and quite empty of people. For the time being, that is. 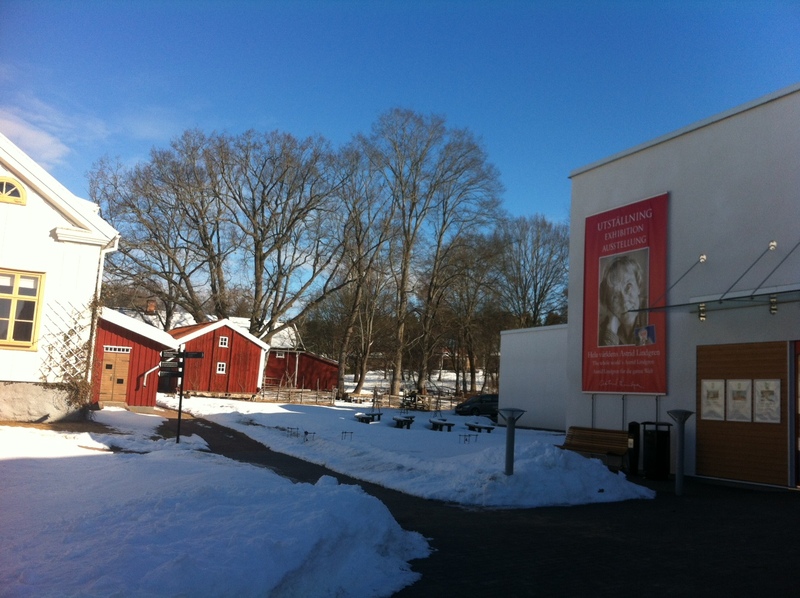 Soon the members of the Astrid Lindgren Memorial Award jury will hold their final meeting in the rectory, next to the cultural centre Astrid Lindgren’s Näs. The press conference will start at 12:45 pm (follow the live broadcast here). Soon we´ll to who the recipient or recipients of 2013 is/are. Näs in Vimmerby, Astrid Lindgren’s childhood home. 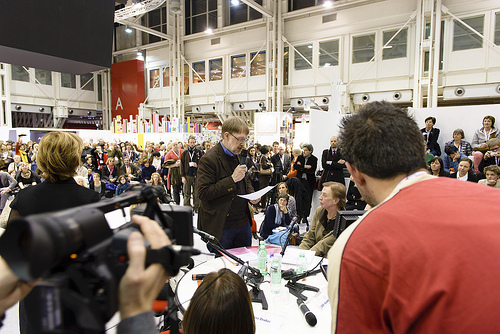 Today the Bologna Children’s Book Fair opened, and so did the Swedish participation as Guest of honor. 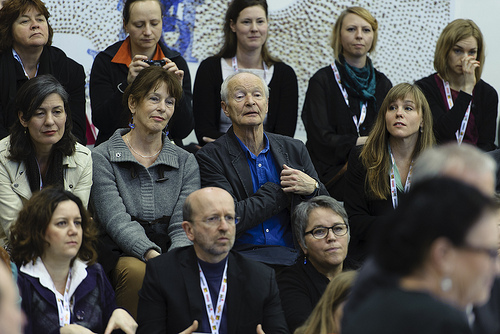 Swedish Minister for Culture Lena Adelsohn Liljeroth were one of the top Swedish participants, along with authors, illustrators, representatives from the book industry, former ALMA recipients, and many many others…! Here are some shoots from today! 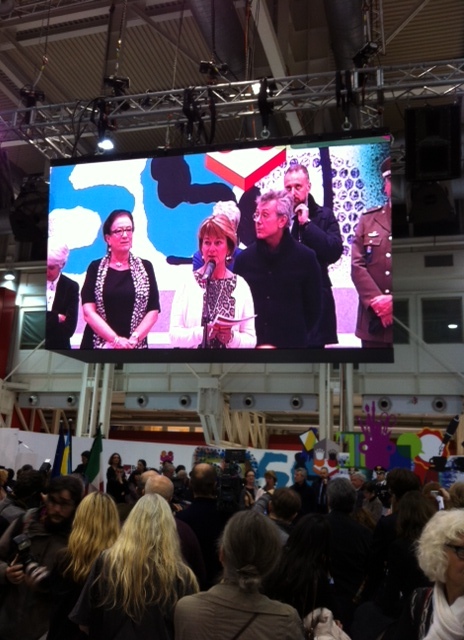 Lena Adelsohn Liljeroth opens the Bologna Children’s Book Fair! 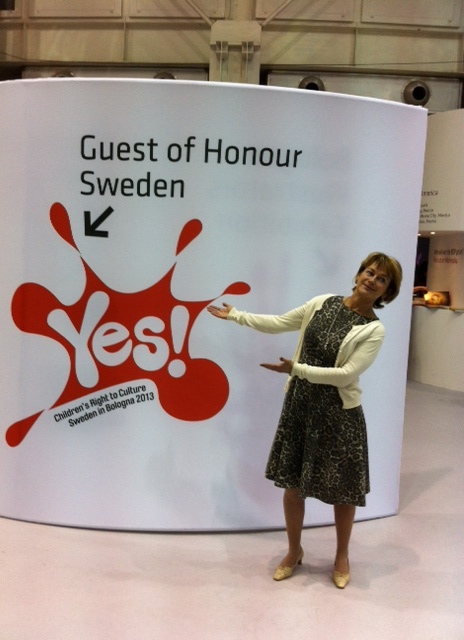 The Swedish overall theme: Children’s Right to Culture. 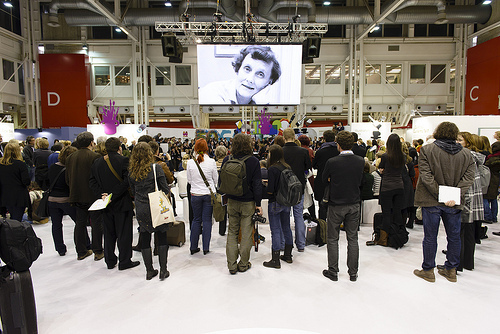 “The Bologna Children’s Book Fair is the world’s largest event for children’s and young adult literature. What makes it unique is the focus on illustration and visual art,” says Lena Adelsohn Liljeroth. “When we read to young children, we arouse their imagination, longing and curiosity regarding images and language. That’s why it’s so important to read to children regularly, and to continue reading to them even when they are older and have learned to read themselves. And by talking to children about the stories we have read, we help them acquire better reading comprehension skills and enrich their vocabulary,” the culture minister continues. The 300-square-metre exhibition presents work of 31 illustrators chosen by an expert jury. The selection has been made from a child’s perspective. The featured illustrators include several long-established names, such as Pernilla Stalfelt, Anna-Clara Tidholm, Gunna Grähs and Jockum Nordström, as well as many artists of the younger generation born in the 1980s. 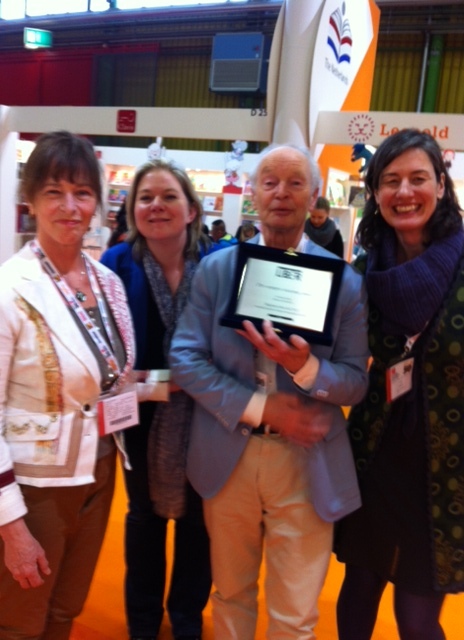 2012 ALMA recipient Guus Kuijer with his wife Corrie (left), Lucienne van der Leije (rights manager) and his pubisher Bärbel Dorweiler from Querido. 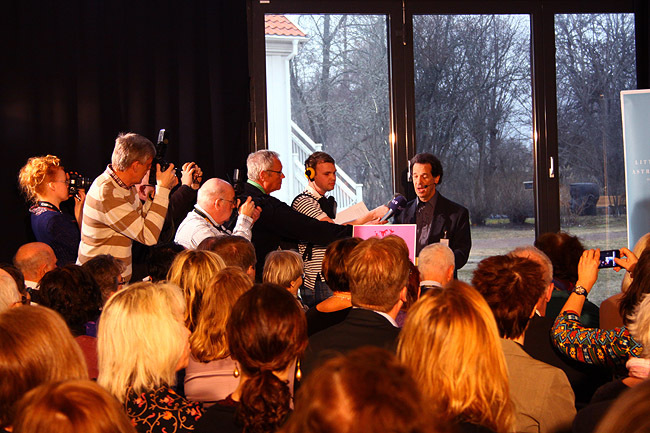 The announcement takes place in Vimmerby, the birthplace of Astrid Lindgren. 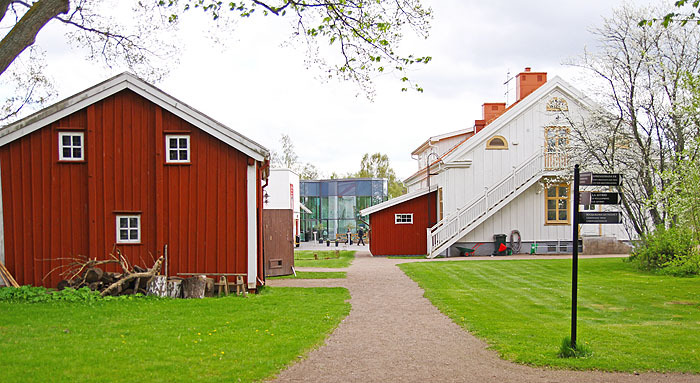 The cultural centre is situated next to Astrid Lindgren’s childhood home. Photo: Emma Jansson. The announcement of this year’s recipient can be followed live on our web, starting 12.50 on Tuesday. It will be followed by a short presentation of the recipient by one of the jury members. Watch jury member Elina Druker’s presentation of last year’s recipient Guus Kuijer here. 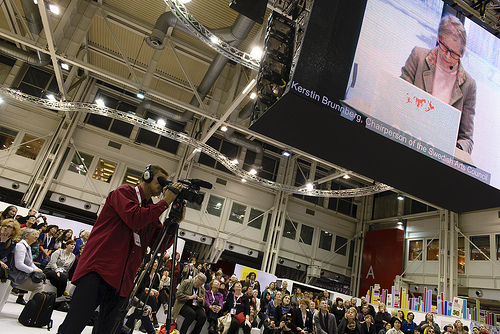 Like the previous years, the announcement in Vimmerby will be streamed by link to the international children’s book fair in Bologna, which is very special for us this year as Sweden as the first Nordic country is guest of honor. The Swedish Minister for Culture, Lena Adelsohn Liljeroth will participate in the ALMA press conference, something we of course are very happy for. 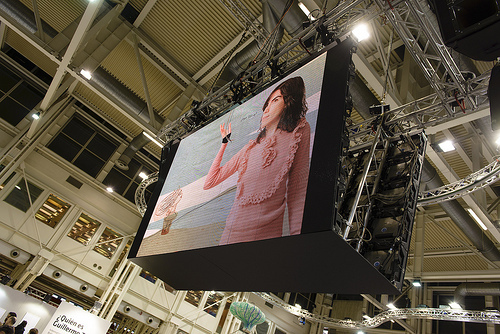 2012 announcement in Bologna. Photo: Stefan Tell. 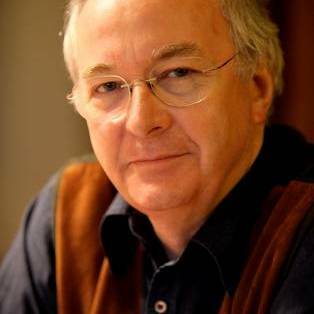 All children should be taught Bible verses and fairy tales, the author and 2005 ALMA recipient Philip Pullman has argued, as he said modern families are too distracted by television and the internet to tell their own stories. In today’s Telegraph, journalist Hannah Furness reports from Philip Pullmans speech yesterday at the Oxford Literary Festival. Pullman read from his 2012 book of Grimm’s fairytales “for young and old” as he joked children should be exposed to stories, “the bloodthirstier the better”. I think it’s very, very important that your children should know these stories,” he told the audience. “Not all of them obviously, but the great ones, the famous ones. “They should also know stories from the Bible and from Greek mythology. Pullman, who is perhaps most famous for his Dark Materials series, added he had previously recommended all trainee teachers learn a selection of stories to entertain their young students. “They will never forget it and they will never forget these stories,” he said of pupils. “It is important; it really is vital. Isn´t it beautiful, the cover of the new ALMA publication containing reading guides of books by our previous recipients. The illustration is made by Lennart Eng, illustrator, graphic designer, tutor and member of the ALMA jury. Is The Devil Latch (Sonya Hartnett) a Gothic novel? Why/why not? What role does The Book of Everything (Guus Kuijer) play? Why does the author have Thomas write in it at various times? The guides will be distributed at the Children’s Book Fair in Bologna (March 25-28), so why not visit our stand C5 in Hall 30 to get a copy! This year’s recipient or recipients of the Astrid Lindgren Memorial Award will be announced on Tuesday March 26 at 1:00 pm. 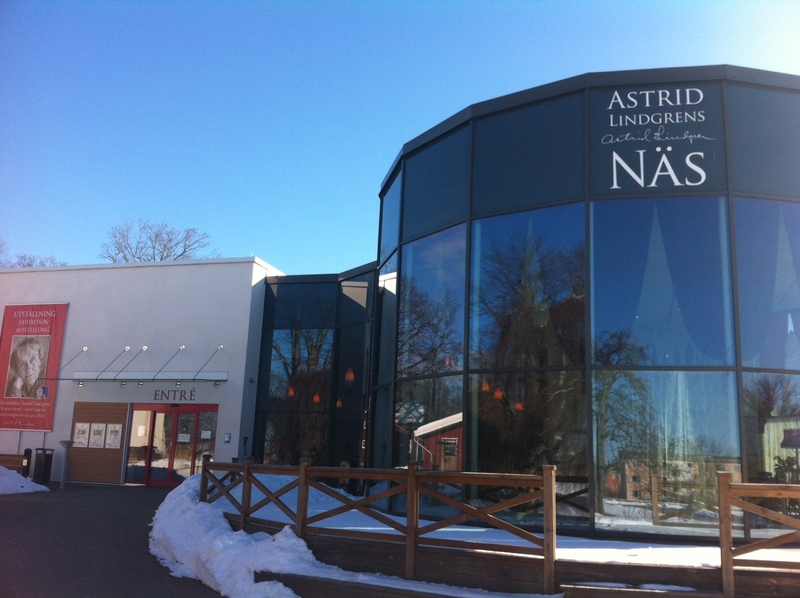 The announcement will take place at Astrid Lindgren’s Näs in Vimmerby, where the Jury Chairman Larry Lempert will announce the recipient or recipients after the jury’s final meeting. 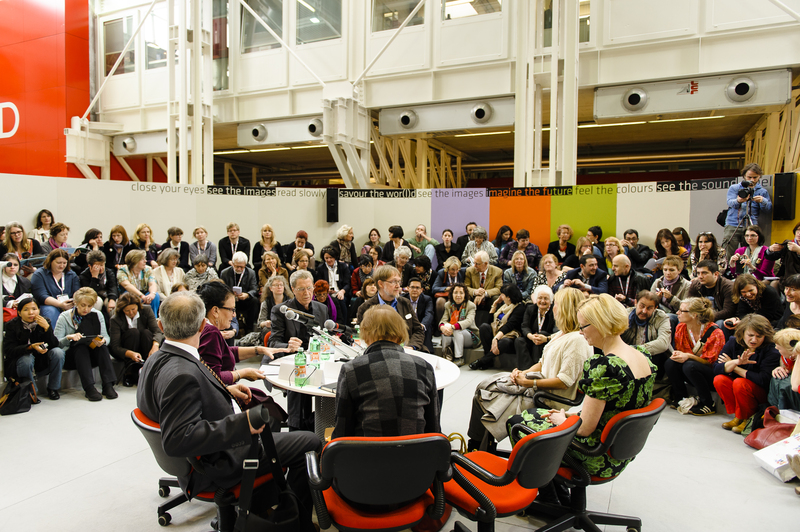 At the same time a press conference is held at the international children’s book fair in Bologna, in the presence of the Swedish Minister for Culture Mrs. Lena Adelsohn Liljeroth. A presentation of the recipient will be given by a member of the jury after the announcement. For this year’s award, 207 candidates from 67 countries are nominated. 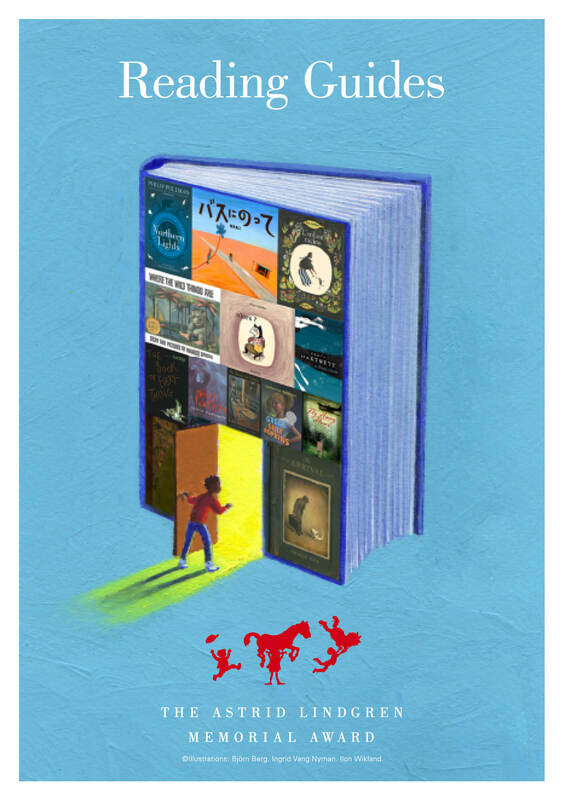 The nominating bodies come from all around the world and consist of international, national and regional groups with extensive and in-depth knowledge of children’s and young adult literature within their language area. The award, which amounts to 5 million Swedish kronor (approx. 560 000 EUR), is given to one or more authors, illustrators or reading promoters working in the spirit of Astrid Lindgren and whose work is characterized by the highest artistic quality. The announcement will be broadcast live on http://www.alma.se/en. High quality videos for Television Broadcast will be available on http://www.thenewsmarket.com/alma. The previous recipients of the Astrid Lindgren Memorial Award are: Guus Kuijer (2012), Shaun Tan (2011), Kitty Crowther (2010), Tamer Institute (2009), Sonya Hartnett (2008), Banco del Libro (2007), Katherine Paterson (2006), Philip Pullman (2005), Ryôji Arai (2005), Lygia Bojunga (2004), Christine Nöstlinger (2003) and Maurice Sendak (2003).